This case study is for The Balnamoon Wind Energy Project, designed for Mr. Michael Johnston of Balnamoon, Crossroads, Keith by Orkney Sustainable Energy Ltd designer Richard Gauld, with data from Report OSE/2358 (Gauld, 2004). The Balnamoon turbine is a single 850kW Vestas V52, which was manufactured in Scotland (Gauld, 2004). The design report lists the Vergnet GEV 15/60 and GEV MP, Enercon E30, and the Nodex N60 as the alternatives that were considered to the V52 before it was chosen based on the specifics of the site of implementation (Gauld, 2004). 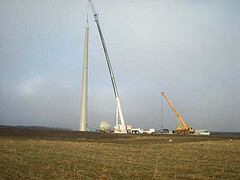 The Vestas V52 has a nameplate rating of 850kW with a, “52m diameter rotor, a tower height of 44m, and a rotational speed varying between 14 and 31 km” (Gauld 2004, 16). 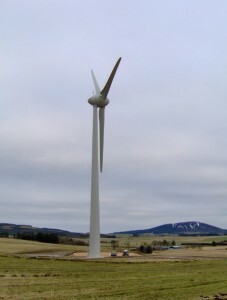 The turbine generates 100dB(A) of noise for wind speeds of 8 m/s and can handle wind speeds up to 10m/s (Gauld 2004). Given the estimated Balnamoon wind speeds of 7.7m/s, the V52 was ultimately chosen (Gauld 2004). Balnamoon produces approximately 2900 MWh of electricity per year, or enough for approximately 500 households (Gauld, 2004, p.7). With estimates of around 2900 MWh of clean energy per year, Balnamoon avoids the following emissions per year: 2800-3400 tonnes of CO2, 40-50 tonnes of SO2, and 8-13 tonnes of NOx (Gauld, 2004, p.22). Construction impacts included increased traffic for laying of a concrete access track and implementation of the turbine as well as 800 tonnes of stone and 200m3 of concrete mix (Gauld, 2004, p.34). Environmental pollution was expected during construction due to emissions primarily from construction machines and transportation of equipment (Gauld, 2004). 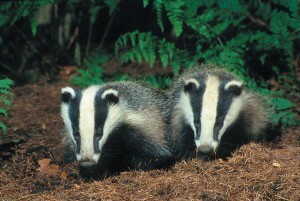 The design report identified multiple species of birds within a 500m radius of the wind turbine, as well as a sett of badgers, a protected species, within 125m of the site, but overall ecological impact was estimated as minor due to the fact that the site was far enough from sites of nature conservation (Gauld, 2004, p.34). The information included in the design report was thorough in its investigation of environmental impact, but it failed to estimate some of the numbers associated with its observations and theory, such as how many birds are expected to be killed by the wind turbine implementation. This concludes my case study on The Balnamoon Wind Energy Project. Gauld, R., 2004, Balnamoon Wind Energy Project: Technical Description and Environmental Information, Orkney Sustainable Energy Ltd, Stormness, Orkney. 45 p, http://www.orkneywind.co.uk/projects/. Quilter, J., 2013, Vestas V52 Collapses in Ireland, Wind Power Monthly, Ireland, http://www.windpowermonthly.com/article/1176014/vestas-v52-collapses-ireland.